The Page of Wands in a Tarot reading is the bearer of good news or advice but could also be making an announcement, although they may not be a stranger rather someone you all ready know or are aware of in the course of everyday life. They are loyal, faithful although could be a little off beat. In the reversed position they are bad news in more ways than one. (From the Third house) A brother, schoolmate, messenger, postman or envoy, functionary or official of subordinate position, generally a younger man, sometimes on an errand; messages, letters, communications, teaching, instruction, lesson, advertisement, advice, announcement. News. (From the eleventh house): A friend, some one in business relation with the querent, or with whom he agrees. Telegraph, telephone and wireless. Intuitive connection, telepathy, invention. Helpful influences in general, helpful people of all sorts, tradesmen, purveyors, etc. Knave of Sceptres – A Good Stranger, Good News, Pleasure, Satisfaction. We have to keep in mind, that the page of Air relates to the Third and to the Eleventh house both. Some of the indications show the mark of aquarian, i.e. uranian parentage, others are purely mercurial. The pages always cover the meaning of houses of Air, as we have seen the page of the airy element–wands–is the most airy of them all. The interpretation is easy enough, and the renderings are quite correct, with the exception of one item: we can never see this page as a ‘stranger’ but rather as an acquaintance, a friend, conforming to the connection with the eleventh house. That with the Third house even may bring his personal standing nearer to the querent, viz. as a brother or schoolmate. The cube in the triangle symbolizes the world of things or objects, and corresponds to the second Heh in IHVH. The card represents the influence of the world of ideas upon the physical body, and is also a symbol of the archetypal idea of a physical body. The whole first quarter of the zodiac, from the beginning of Aries to the end of Gemini, or from March 21st to June 20th, inclusive. A young person, youth or girl. Brilliant mind, courageous disposition, perhaps given to sudden anger, and desirous of power. Capable of great enthusiasm. Revengeful at the least opposition, headstrong, theatrical, unstable, domineering, and decidedly superficial. Red-gold hair and blue eyes. 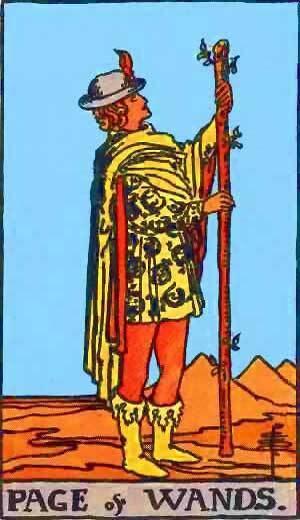 Often this card is the indicator of a messenger. N.B. Note carefully the time-attributions, for upon them and their astrological significance, blended with that of the numbers, the divinatory meanings are based. But at this point in your work you should not attempt to locate events by the time-period of the separate cards. More information on the Page of Wands Tarot card. This entry was posted in Tarot, Runes and Divination and tagged evil, feelings, love, page of cups, page of wands, tarot, the world, wands, zodiac. Bookmark the permalink. ← Positive and Dark Side of the Zodiac – What’s Yours? or Theirs!